Ed. Note: This is the inaugural article of “The Retirees’ Voice”, a new column from the perspective of retired SMCCCD faculty members. It is written by Ernie Rodriguez, former psychology professor at CSM and Cañada College and past AFT 1493 President. One of the joys of retirement is freedom from what I came to call the tyranny of the academic calendar. While the long summer break and a month off between semesters are certainly great perks, I always felt that the lack of flexible time off due to the constraints of the academic calendar limited my freedom to fully enjoy life. It is wonderful to be able to travel and engage in activities at any time of the year. As one example, for the last few years, I and my wife Allyson, have taken advantage of this flexibility to volunteer our time as teacher’s aides at an elementary school in L.A.’s Boyle Heights neighborhood. Why volunteer in Boyle Heights as opposed to engaging in a worthwhile activity closer to home? It all started with my son, David. While still obtaining his M.A. in education from UCLA, David was hired to teach for Extera Public School, an elementary school in Boyle Heights. I loved that David was excited about this teaching opportunity. Boyle Heights is 95% Latino. This demographic guaranteed that all of David’s students would be Latino, primarily Mexican-American. Given my own history as a Latino educator whose Latino heritage, in part derived from Southern California, I was proud that David was reconnecting with his cultural roots. I was proud that David would be helping young Latino children move ahead in their lives. For many years I was aware of the Boyle Heights community. At one time Boyle Heights was the center of the Jewish community in L.A. At another time Boyle Heights was a Japanese American community. More recently, Boyle Heights, like its neighbor East L.A., has become legendary for both high levels of poverty and gang activity. One current assessment of Latino gangs identifies 21 active street gangs in Boyle Heights. Just down the street from David’s school are the offices of Homeboy Industries. A couple of years ago CNN aired an hour-long documentary about Homeboy Industries. Homeboy Industries focuses on helping former gang members lead more successful lives primarily through employment assistance programs. When I learned that David would be teaching third and fourth grade students in Boyle Heights I was thrilled that he would be working with the Mexican-American community. I also knew that most of these children would come into his classes already seriously behind in academic achievement. As a Latino educator, I had for many years been aware of the demographics related to ethnicity and educational achievement in California. Years ago I attended a conference with a terrible name, “the Re-Hispanization of California Conference”. This conference made me aware of the fact that much of the future economic well-being of the state of California depends on how successful Latino students are in obtaining an education. The conference theme emphasized that demographic indicators point to a future California where a majority of the working population will be Latino. Currently, according to kidsdata.org, 52.7% of California elementary school students are Hispanic/Latino. The next highest ethnic group are white students who account for only 25.5% of the statewide elementary school population. 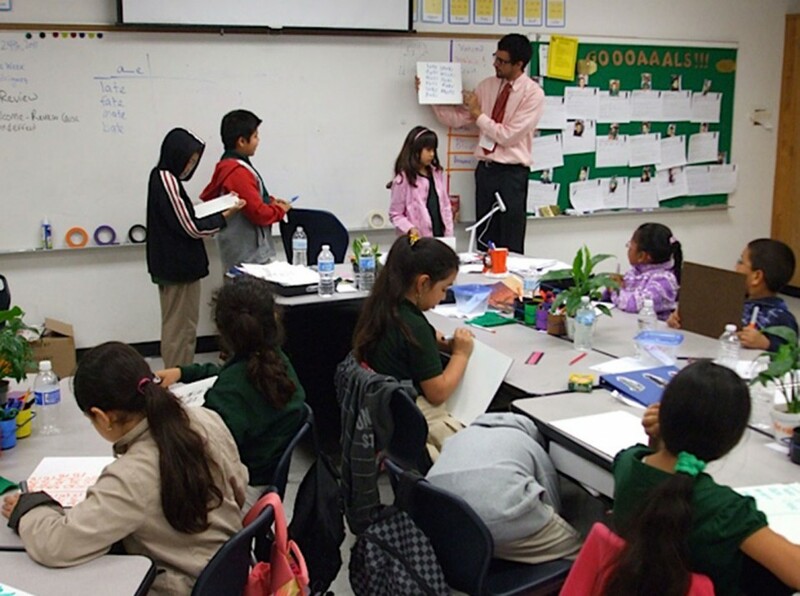 In L.A., 64.6% of elementary school students are Latino. So it does seem pretty clear that for California to prosper Latino students must also prosper. The young students David works with face a whole host of barriers to educational achievement. They come from a community mired in poverty, where typically English is a second language, and where caring parents often struggle to earn a living and often have little energy left to devote to supporting their children’s efforts in school. Anyone who knows educational research outcomes knows that we continue to face a crisis regarding the failure of the school system to adequately educate Latino students. 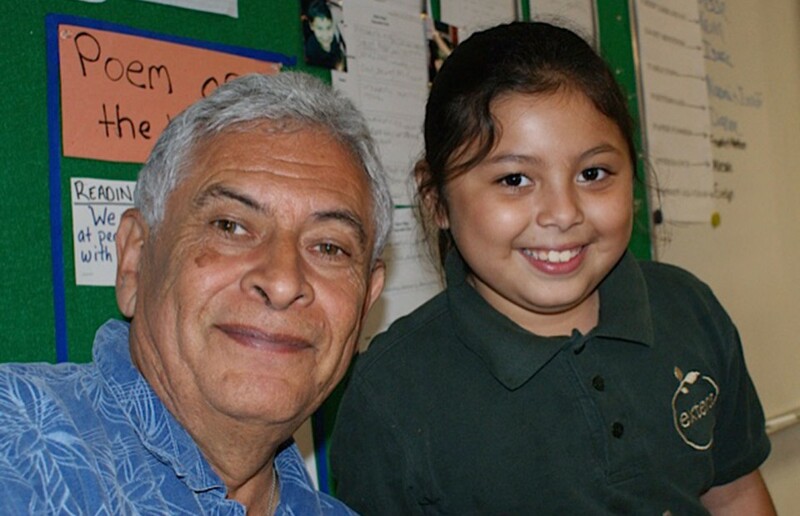 Since retiring, I have traveled to Southern California a number of times to help David as his classroom aide. On each visit I have been deeply and profoundly moved by the love and generosity shown to me by the children and their parents. The smiling faces, cheers and hugs from students always warm my heart. The fact that these young students are so wonderful motivates David in his work as a teacher. He feels a determination to help these students succeed. They are so innocent and don’t yet realize the many challenges that lie ahead. Just in the short time I have spent with them I always feel protective and desperately want them to succeed. Having come from a very similar background, I identify with these students. My most recent visit to David’s school was planned to coincide with Dia de Los Muertos. Allyson and I spent a week working with David’s fourth graders on Day of the Dead activities. To avoid any confusion, it is important to note that Dia de Los Muertos is not a religious activity. Pre-Columbian and Mexican cultural beliefs value the Day of the Dead as a time of year when there is a greater connection between the world of the living and the world of the dead. Because of this natural relaxation of the boundary that separates living from dead, the belief is that this time of year presents a special opportunity to celebrate our connection with loved ones who have passed on and to honor death as a normal part of life. During the week leading up to Dia de Los Muertos there are many celebrations and observances in Boyle Heights, East L.A. and in L.A. in general. The children and parents David teaches are familiar with and typically celebrate Dia de Los Muertos. While Allyson and I were there we helped the students build an altar, helped them make a Catrina, helped in the making of decorated sugar skulls, taught the students how to make paper flowers, engaged in story telling and sharing around the topic of death and Day of the Dead and helped students with reading and academic assignments related to Dia de Los Muertos. We also supported David’s students in constructing a second altar honoring endangered and extinct animals. It was a touching and powerful experience to see how these young students expressed their beliefs and experiences related to death. Western culture is so phobic about death that a number of books, such as Becker’s classic “Denial of Death”, have addressed this fear. I always find it refreshing and healing to be able to openly embrace the normalcy of death in the context of a supportive community. There were many examples of sharing by David’s students that touched my heart. Just to mention one, a girl named Angelica brought an empty wooden box to place on the altar in honor of her family. She told the story that this box was first owned by her abuelita and had been passed down to her for safekeeping. The box was both a concrete and symbolic representation of Angelica’s family history, of the narrative of her family’s journey across generations. When I tell people that David teaches in Boyle Heights the general reaction ranges from horror to sympathy that David is working in such a terrible place. I feel a great sense of sadness when I hear such comments. My sadness comes from knowing that the children and families David works with are wonderful. Despite living in difficult circumstances, these children are warm, loving and enthusiastic. They deserve our very best. David has been designated as the curriculum specialist at his school. He has been amazingly creative in working to build a culturally relevant curriculum designed to help these students realize success in the context of the new Common Core standards. This is no small task. I am very proud of David and of his students. Hopefully, some of the photos accompanying this article will communicate the vitality and positive energy of these students, whose success or failure represents not only their own individual futures, but our collective future. On a final note, I have never really liked the term “retirement”. Recently, I read an article that talked about this stage of life as our “second adulthood”. I like this concept much better. While I loved my teaching career in the San Mateo Community College District, I think it is important to keep in mind that the world is a very large place with many worthwhile and important activities and options. It has always puzzled me that some people can’t stand retirement. There is so much of value to do in the world. My life has been enriched and fulfilled by the opportunity to work with my son, David, and his wonderful students.